Rhubarb is a great springtime treat for a lot of people. Not everyone has had the fortune to enjoy it as it only grows well in colder climates. You might find it in stores or sold at farmer’s markets though. It is pretty tart and needs to be sweetened before eating. That makes it perfect for desserts. 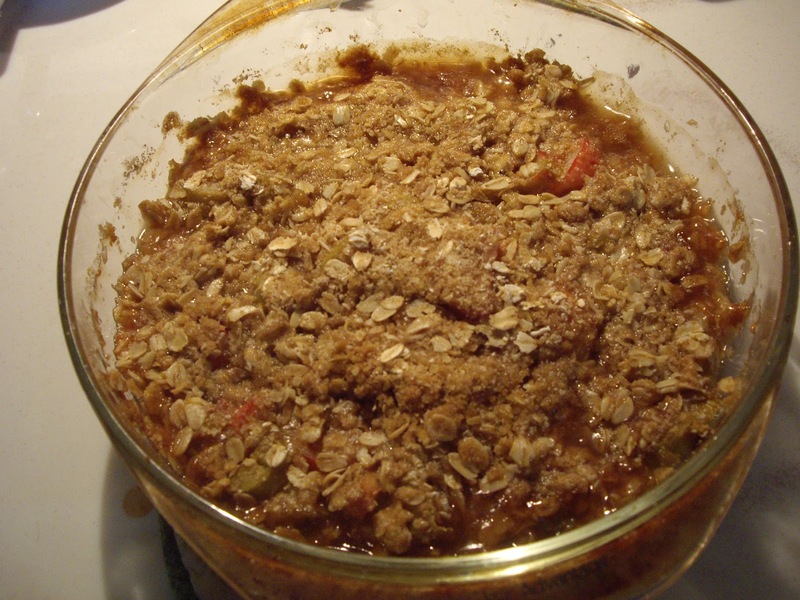 I came up with this after looking and not finding a rhubarb crisp recipe like what I wanted. I used oat flour, but feel free to use all-purpose or other flour if you would like. You will need a 2 quart casserole or baking dish. For the filling: In a large bowl combine the brown sugar, rhubarb, and corn starch. Transfer that to your baking dish. For the topping: In another bowl mix the flour, oatmeal, brown sugar, and cinnamon. Cut in the butter with your hands, fork, or pastry cutter until the mixture is all crumbly. Sprinkle the topping over the rhubarb. Bake in the preheated oven for 40 to 45 minutes until the rhubarb juice is bubbling thickly all over. Take out of the oven and let cool for at least 45 minutes. It will be still be plenty warm. If you cut into it sooner the filling may run a lot more than you’d like. This sounds really good. When I was first given strawberry rhubarb pie, I was afraid to eat it. I was pleasantly surprised at how good it was! Do you have a cookbook available to buy? If so, I'd buy it. I'm getting quite a collection of notecards here! Hi Ruth .. I do love rhubarb .. I asked my uncle after my aunt's death .. whether by chance they had any rhubarb – as they had a prolfic garden .. he said he buried under the compost heap – as he hated it!!!! C'est la vie – we laughed .. Thank you, Sherry. I don't have a cookbook. I never gave any thought to writing one. That's funny. A couple years ago, I divided mine and gave some to a friend. Her brother in law used round-up on hers because he said he didn't think anyone liked it. Lynn, it really does have a taste all it's own.